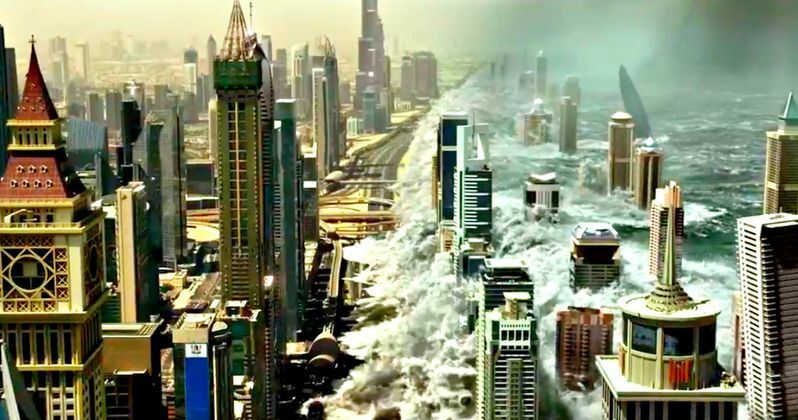 After showing us some of the deadly effects of a worldwide manmade storm with several teasers yesterday, Warner Bros. and Skydance have unteathered the full trailer for the intense new thriller Geostorm. And it's like watching all of your favorite disaster movies put in a blender and served on puree. It's an incredible blast of destruction that should keep fans of films like Independence Day and 2012 incredibly happy this fall. Trust us when we say, it does not disappoint on that level. After an unprecedented series of natural disasters threatened the planet, the world's leaders came together to create an intricate network of satellites to control the global climate and keep everyone safe. But now, something has gone wrong, the system built to protect the Earth is attacking it, and it's a race against the clock to uncover the real threat before a worldwide geostorm wipes out everything...and everyone along with it. Dean Devlin (writer/producer, Independence Day) makes his feature film directorial debut with suspense thriller Geostorm, starring Gerard Butler (Olympus Has Fallen, 300), Jim Sturgess (Cloud Atlas), Abbie Cornish (Limitless), Alexandra Maria Lara (Rush), Daniel Wu (The Man with the Iron Fists, Warcraft: The Beginning), with Oscar nominees Ed Harris (The Hours, Apollo 13) and Andy Garcia (The Godfather: Part III). Butler stars as Jake, a scientist who, along with his brother, Max, played by Sturgess, is tasked with solving the satellite program's malfunction. Cornish stars as Secret Service agent Sarah Wilson; Lara as Ute Fassbinder, the ISS astronaut who runs the space station; Wu as Cheng, the Hong Kong-based supervisor for the Dutch Boy Program; with Garcia as U.S. President Andrew Palma; and Harris as Secretary of State Leonard Dekkom. The film also stars Adepero Oduye (The Big Short, 12 Years a Slave), Amr Waked (Lucy, Syriana), Robert Sheehan (The Mortal Instruments: City of Bones, Season of the Witch) and Eugenio Derbez (Instructions Not Included). The film, written by Dean Devlin & Paul Guyot, is being produced by Skydance's David Ellison, Devlin, and Skydance's Dana Goldberg. Herbert W. Gains and Electric Entertainment's Marc Roskin are the executive producers. Rachel Olschan of Electric Entertainment and Cliff Lanning co-produce. The behind-the-scenes creative team includes director of photography Roberto Schaefer (Finding Neverland, Quantum of Solace), production designer Kirk M. Petruccelli (White House Down), costume designer Susan Matheson (The Big Short, Safehouse) and VFX supervisor Jeffrey A. Okun (Clash of the Titans, The Day the Earth Stood Still). A Warner Bros. Pictures and Skydance presentation, Geostorm is a joint venture between Skydance and Electric Entertainment, Inc. Set to hit theaters October 20, 2017, it will be distributed in 3D and 2D in select theaters and IMAX, by Warner Bros. Pictures, a Warner Bros. Entertainment Company. We have the first trailer for you to watch in all of its glory. And while it does look like something that might have come from Roland Emmerich, it's important to note that director Devlin and Emmerich have a long history of collaborating with each other. So that's no accident. Grab your life vest, make sure you have your supplies stored up, and get ready for a sneak peek at one of this fall's most terrifying movies that doesn't revolve around a serial killer.